There are many types of ore crushers, and the ore crushers commonly used in ore crushing production types include jaw crushers, impact crushers, and ore crushing machines such as hammer crushers, cone crushers, and hydraulic crushers. How to choose the right one? Ore crusher? Generally, the type of ore crusher can be selected according to the material crushed by the ore crusher. 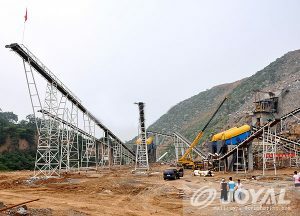 Shanghai Joyal Mining Machinery here and everyone talk about the crusher selected for granite crushing. The crushing of general stone is usually determined by the following factors: 1) the type of broken material; 2) the hardness of the crushed material, the silicon content, the water content; 3) the average particle size of the incoming and outgoing materials; 4) the hourly output. Granite is different from other ores. The hardness of granite is very high. If the selected ore crusher is not good, not only the low output will cause damage to the parts of the crusher, so the choice of granite crushing equipment should be cautious. Joyal recommends the composite crusher as the crushing process of granite. The crushing ratio of the composite crusher is large, and the maximum crushing ratio can reach the discharge granularity and can be adjusted freely. It is not affected by the wear of the hammer and the liner; The strip setting is not easy to block when the material with high moisture content and high mud content is broken; the elastic adjusting mechanism is adopted, and the unbreakable material can be automatically discharged without causing equipment damage. Moreover, the bearing of the composite crusher is horizontally arranged and has a long service life, and can crush materials with high temperature (such as cement clinker); the composite body of the composite crusher has a unique structure, and when the material is crushed, the rotor body hardly wears; the rear cavity is set. With a screw or hydraulic opening mechanism, the consumables can be easily replaced without using the main equipment. The multiple advantages of the composite crusher make it a very suitable choice for granite crushing.